A common question asked by prospective franchisees is who should pay the cost of attending the Franchise Discovery Day? Should the prospective franchisee pay for their own costs or should the franchisor cover the prospective franchisees costs? Some franchisors pay for everything. They tend to believe the following " ‘the more people we can bring in for our Discovery Day, the more new franchisees we will attract. Even if the person is not really committed, we want them in for Discovery Day because if they come, they may change their mind.’ Although there are certainly exceptions, often these companies have a lower initial investment and tend to attract individuals who are in an employee mentality. One the other hand, some franchisors don’t pay for anything. They tend to believe the following " ‘We are only interested in meeting with serious people who are willing to invest in their future. Investing a few hundred dollars to attend a franchise Discovery Day is the first test. If they are not willing to do this, then they are not really players and we don’t want to dedicate an entire day of staff time focused on them.’ Again, there are exceptions to this rule but often these franchisors tend to deal with a more sophisticated investor/business owner. These experienced, self reliant individuals do not expect their expenses to be reimbursed. The third type is the franchisor who splits the middle. They require the franchisee pay something " such as the airline ticket -but they also cover part of the expense, such as the hotel and/or airport transport and/or food. This approach achieves both objectives. It allows the individual to invest in their self and show seriousness but it also demonstrates to the prospective franchisee that the franchisor is excited to meet them. Finally, some franchisors offer to reimburse some or all expenses if you become a franchisee. Similar to the item above, this approach requires that the prospective franchisee have a high degree of seriousness in the process while also sending the message that the franchisor is willing to extend a courtesy. Often the discussion of who should pay for Discovery Day is broken down into an interpretation of roles. If it is a recruiting or sales relationship where the franchisor is the vendor (seller) and the franchisee is the consumer (buyer), then it stands to reason that the seller should do whatever they can to ‘make the sale’. It would be similar to selling a time share where vendors give away vacations if you attend the sales meeting or a company who is trying to recruit you to work for them. On the other hand, if granting a franchise is a more equitable selection process where both parties need to feel comfortable entering into a relationship, then it would stand to reason that each party would pay for their own expenses related to a business meeting where a potential long term relationship is being discussed. Underlying this discussion is one of personal responsibility and entitlement. Moving from an employee mentality to a business owner mentality requires a decision to take control of your future and to be responsible for your decisions. When a franchisor pays for all the expenses, it fits with the former employee’s feeling of entitlement that ‘expenses’ should be ‘reimbursed’. However, reimbursing these expenses does not help a person evolve in regard to their understanding of what it means to be a business owner. As a business owner, you are not entitled to have your ‘expenses’ reimbursed. Business owners make investments because they believe the investment has the potential for a positive outcome. Seasoned business owners know this and they expect to pay for their own expenses. If you are transitioning from an employee role to an ownership role, it is good to understand this prior to investing in a franchised business. 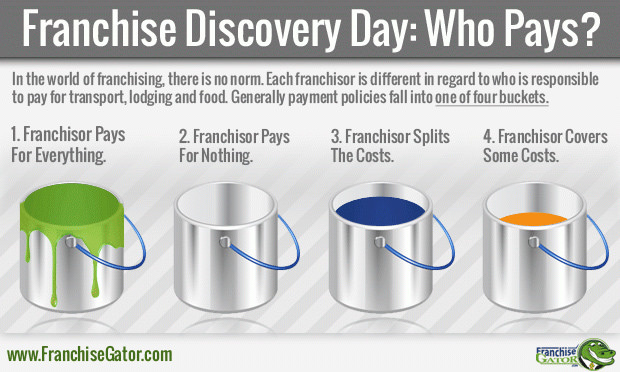 The real answer regarding the cost to attend a franchise Discovery Day lies within you. What role are you prepared to embrace? If you want to be a business owner, forget entitlement and take ownership of the process. If you cannot overcome the feeling that you are somehow entitled to have your expenses reimbursed, maybe you should reconsider whether business ownership is for you.